I live and pastor in New Hampshire, so political emails and phone calls are not unexpected, even though I am still relatively new to the state. But the wording of this email was curious. For instance, the assumption I “supporting” Senator Paul’s efforts to “bring Constitutional values to Washington” or to “advance the conservative movement”. 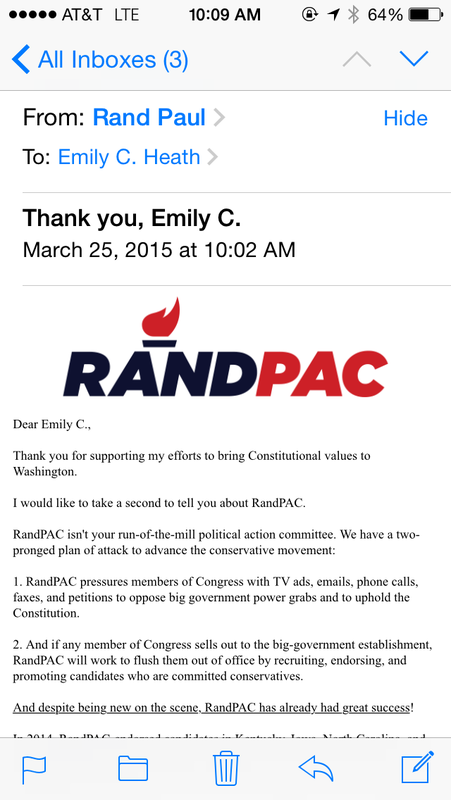 I had never signed up on any Rand Paul list, or even any Republican party list. So, I came to a logical conclusion about why I was getting the emails: my college friends who delight in signing one another up for political causes we find objectionable had scored another victory. “Very funny, y’all,” I thought, as I posted a screenshot of the email up on Facebook calling them out. In the end it turns out that my college friends had nothing to do with it. In fact, that Facebook post made it clear that I was far from the only New Hampshire pastor getting spammed by Rand Paul’s campaign. First one clergy colleague, and then others nearby reported receiving the same emails. That was when I actually checked which email address was being used. I have a personal email, the one my friends would know, and I have a church email address, one that someone looking at church websites or lists of clergy would find. And it was the church email address, the .org of a non-profit religious organization, that was being used for the political ads. 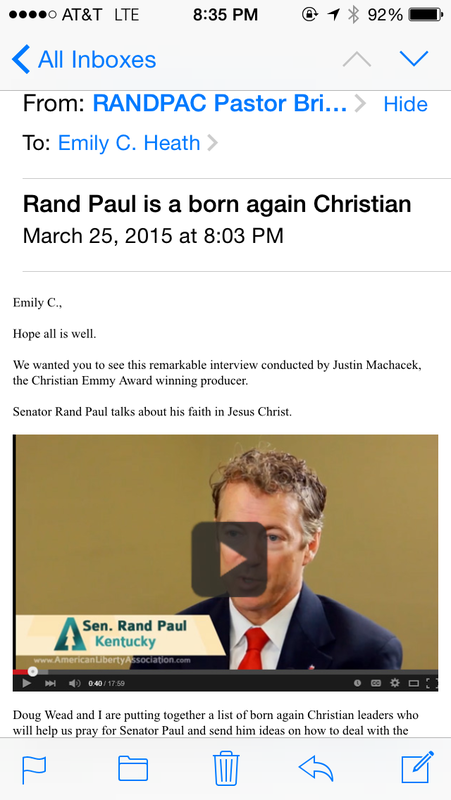 In this email a video of Senator Paul’s faith testimony is included as well. Presumably our shared Christian faith is supposed to make me feel like I should vote for him. At the bottom of the email was also a link to a “feedback” site where I could say what was important to me as a Christian by signing a “statement of faith”. Let me be clear. 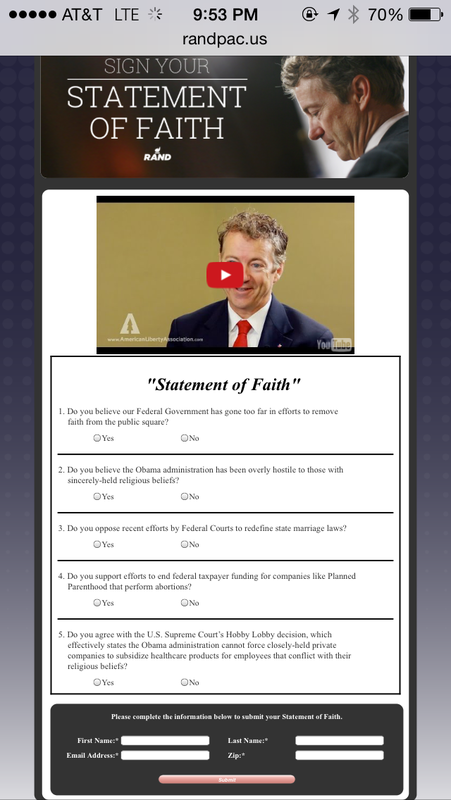 I have a personal statement of faith, and Rand Paul is in no way whatsoever a part of it. Through the last few days I have received more emails from Rand Paul’s campaign. I have contemplated unsubscribing, but at this point I’m interested in seeing what he sends to me. I’m also curious how many other candidates will also be finding my email address, and those of my colleagues, and sending us unsolicited campaign announcements. Why does this disturb me? It’s not because I’m not interested in politics or good governance. In college I spent my summers interning in the U.S. House of Representatives before deciding the ministry was my real calling. But, I have always kept abreast of elections, and made informed voting choices. In fact, I’m excited to watch the New Hampshire primary play out in my community over the next year. The town I live in frequently draws visits from candidates, including to the town hall right next to the church. I find this all fascinating. But that is who I am as a private citizen. Yes, my faith plays a role in my voting. When I enter the polls I don’t leave my faith behind. And, as a pastor I encourage people to vote, and to make their decisions about whom to vote for out of their own personal faith commitments. But, beyond that, I never encourage anyone to vote for a specific candidate or party. Because that is not the role of the pastor, or the church. In fact, it goes against everything we believe in this country about separation of church and state (a tenant that protects not only the state but also the church). If a pastor is telling their congregation how to vote, they are overstepping both legally and morally. And yet, I know of some pastors who do exactly that. Some even openly challenge the IRS bans on promoting specific candidates. I find this deeply problematic. I believe Rand Paul, and perhaps others, know that. And perhaps when they went looking for the email addresses of New Hampshire pastors, they hoped that we would start talking about Paul’s faith or his candidacy. Maybe we would help to being Christian voters onto his campaign, and give him a leg up in this first primary state. And perhaps somewhere in Iowa my clergy colleagues there are getting the same emails too. But Senator Paul will have no place in the pulpit of my church. And, frankly, he will have no place on my ballot next January either. The pulpit is reserved for Jesus. The ballot for one who will respect the lines drawn between church and state. Our denomination helped to write that separation of church and state, and hurrah for it. Because of it we have the freedom to worship God without being told exactly who God is and how to worship. Each of us needs to come to God on our own, not by some cookie cutter way of believing. Thank you for sharing this. I would like to re-blog it to share with the readers I have in my area. If you would rather I not re-blog please let me know and I will remove it. Re blogging so my readers could learn of this. I listened to my pastor declare last Wednesday night that JESUS is IN the voting booth with you. I was rather startled by that pronouncement. Of course I know HE is always with me. Sounded kind of political during a bible study. I too appreciate the seperation of church and state.